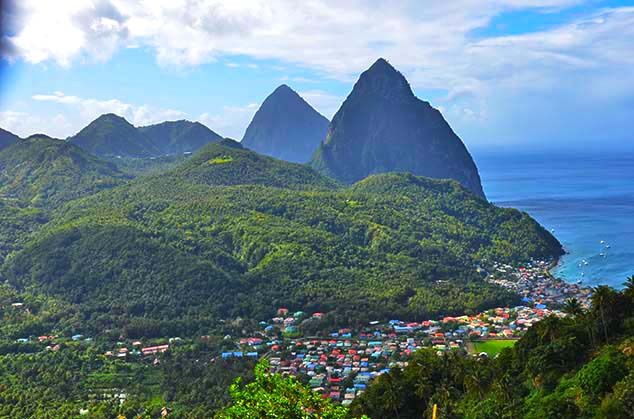 The two towering volcanic cones on the southwest coast (Gros Piton and Petit Piton) remain navigational aides for mariners, and are regarded as one of the Caribbean's and the planet's most famous landmarks. 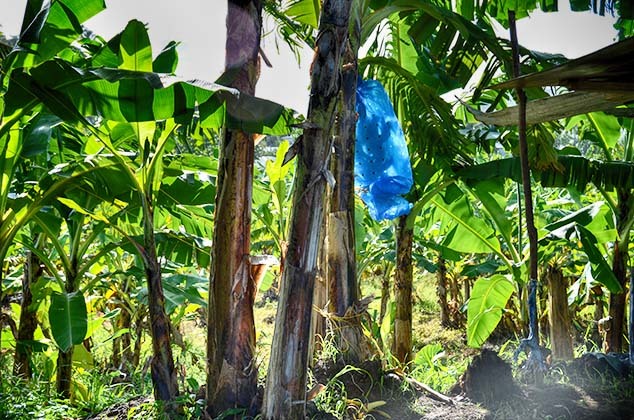 Banana growers use bunch covers (plastic bags open at both ends that they slip over the bunch and tie at the top) to protect bananas from diseases, insects, sunburn and marauders. In 2010, Hurricane Tomas battered the banana business on St. Lucia, and today, low banana prices due to over-supply on the international market has really hurt growers on the island. 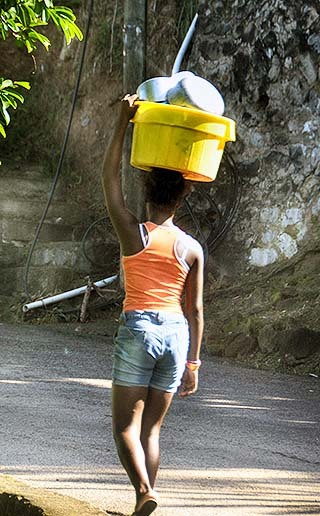 Washday in rural St. Lucia. Road art on a mountain road. The island is breezy, and clothes dry fast. 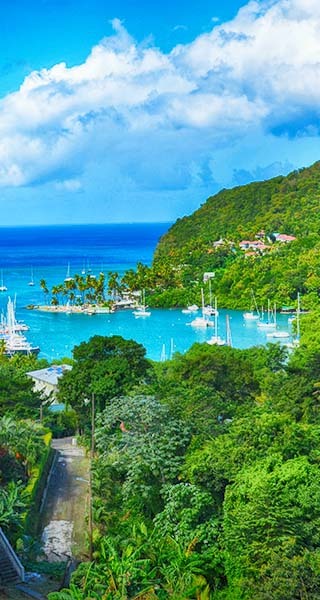 A small slice of Marigot Bay, St. Lucia. Waiting for the bus on a country road. 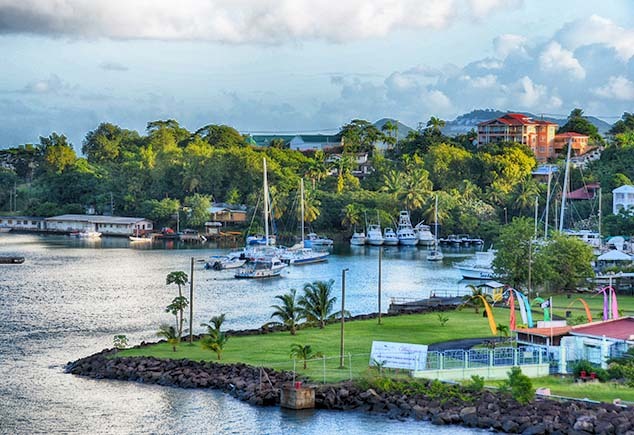 Castries is the capital and largest city of St. Lucia. 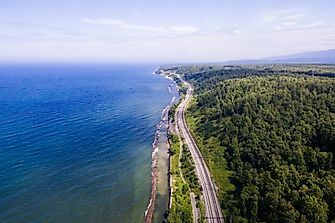 Its sheltered harbor receives cargo vessels, ferry boats, and cruise ships. 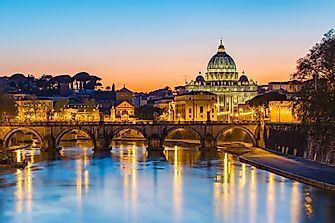 It houses the seat of government and the head offices of many foreign and local businesses. 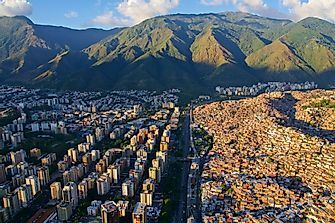 Duty-free shopping facilities are available, and buses and taxis can easily transport visitors to other destination across the island country. This small bay (or cove) near the entrance to Castries harbor, itself a safe harbor for assorted pleasure boats. 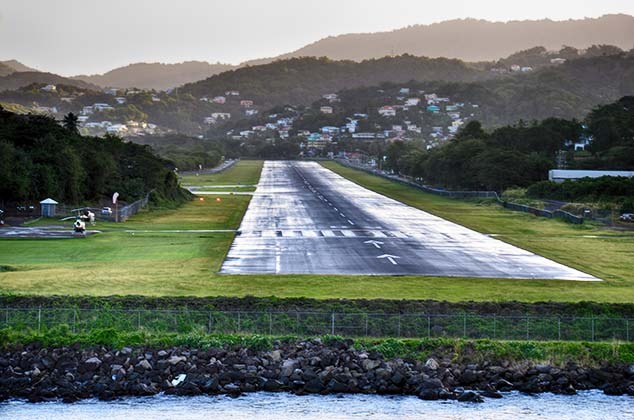 This is the only runway at George F. L. Charles Airport (formerly Vigie Airport) in Saint Lucia. 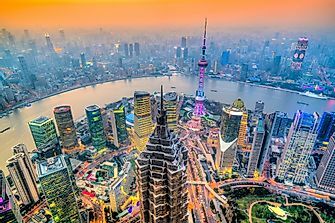 It is the smaller of two airports, while the other is the Hewanorra International Airport in the far southern reaches of the island. 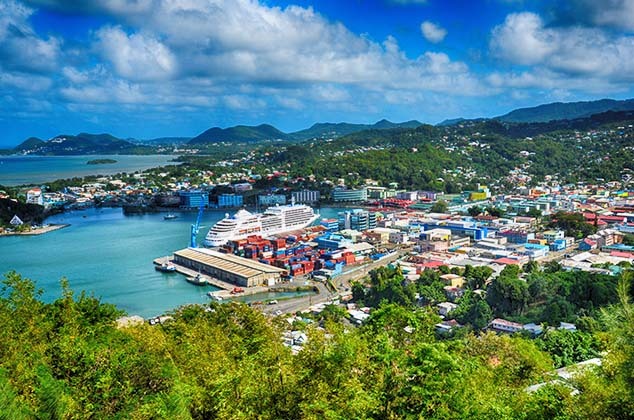 Note that large ships (especially cruise ships) must time their approach into the Castries harbor as planes landing at Charles Airport make their final approach across the same harbor. The colorful city of Soufriere is considered the real star of St. Lucia. It has a great sandy beach, coral reefs, rainforest's, nearby water falls, the Soufriere Volcano (the World's only drive-in Volcano) and of course, the Majestic Twin Pitons. 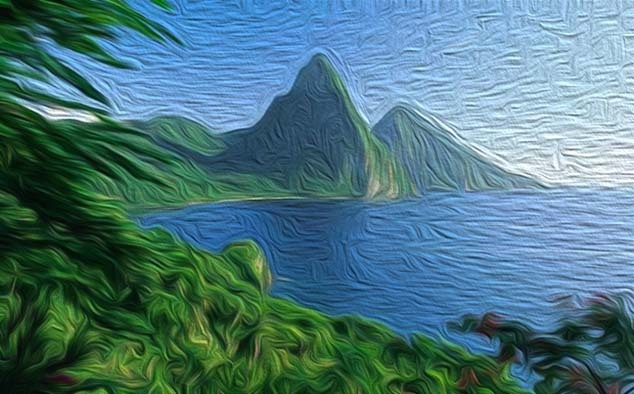 The famous Pitons are two volcanic plugs (a World Heritage Site) just to the south of Soufriere, St. Lucia. The Gros Piton is 771 m high, and the Petit Piton is 743 m high. 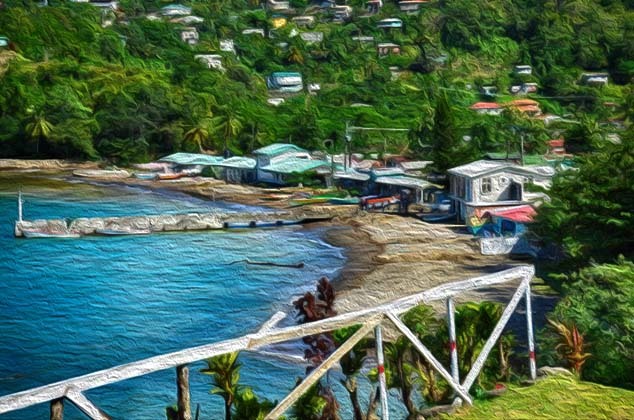 This is a photograph of same from the Caribbean Sea, with a Photoshop watercolor filter applied. 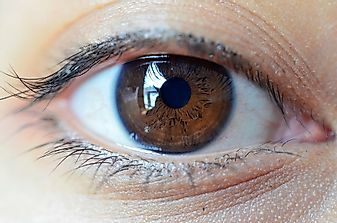 They are stunning to view in person. 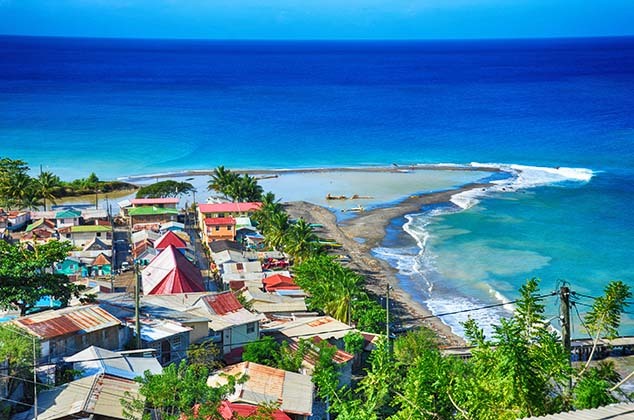 The relatively small fishing village of Canaries is positioned along on the west coast of St. Lucia. Until the 1960s there was no road transport to the village and it was only accessible by boat. 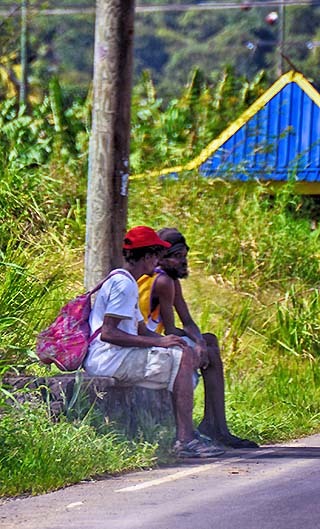 Since the construction of the West Coast Road it is a stop on that road between Castries and Soufriere. On Christmas Eve, 2013, the town was severely damage by torrential rains. 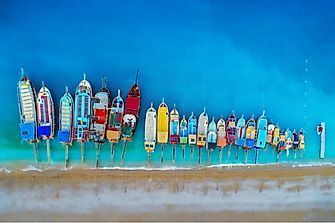 This is a watercolor view of Canaries. Its name is derived from the Amerindian word for cooking pots. In the past Canaries had a large sugar plantation that ran inland up into the valley, but that industry is now gone. Historical records indicate that Canaries was established in the mid-18th century, and the original settlers came from the neighboring island of Martinique. 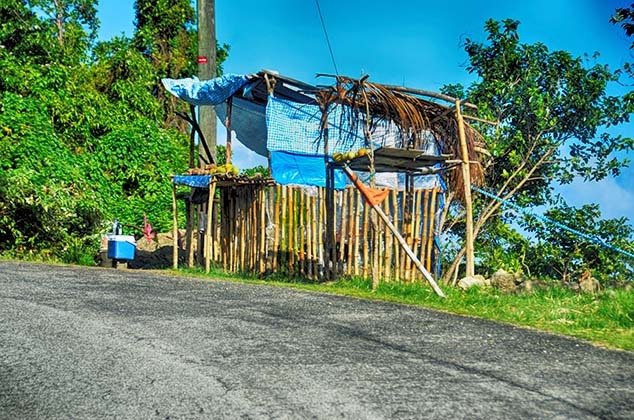 Along the roads on most Caribbean islands locals set up roadside stands, often with crafts, local fruit and vegetables for sale. On some islands were scooters are a common mode of transportation, small jars of gasoline are sold. 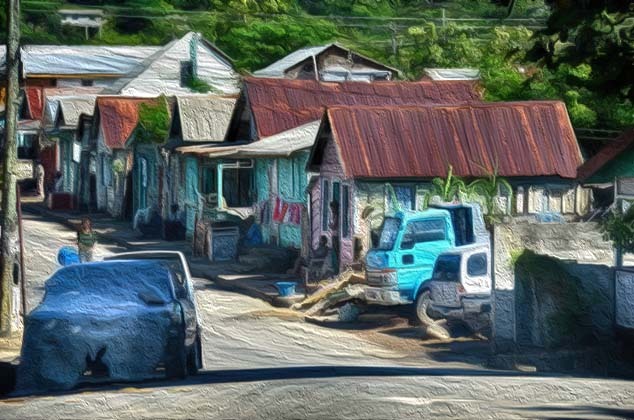 This is a Photoshop watercolor filter applied to a photo of the main road running through a small town on St. Lucia.